All afternoon there has been a chirping of birds. And the sun lies, warming and still, on the Western sides of puffed branches. When is a pine not a pine? 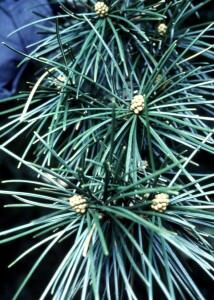 Sciadopitys verticillata the Japanese umbrella pine actually is not botanically a pine. It is not even classified within the pine family Pinaceae but rather is found in its own family, the Sciadopityaceae. Common name confusion aside this is a true “connoisseur’s choice” conifer. The Japanese umbrella pine has a history going back to the dinosaurs, with paleobotanists dating fossils to 230 million years ago. Native to the forests of southern Japan it was first described to Europeans by Swedish botanist Carl Peter Thunberg (1743-1828) in his 1784 Flora Japonica. Half a century later the 1842 work by German-born Phillip Franz von Siebold (1796-1866) also titled Flora Japonica attracted the attention of notable American botanist Asa Gray (1810-1888, Lot 3904 Holly Path). Gray famously referred to Siebold’s work in his research of plant geography that supported pre-publication Charles Darwin’s (1809-1882) On the Origin of Species. 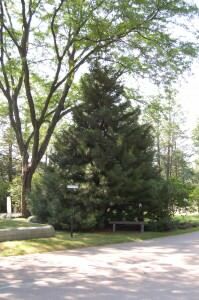 On your next visit to Mount Auburn look for our Japanese umbrella pines found growing opposite the administration office, on Lawn Avenue, Central Avenue, Willow Avenue, Story Road, and Meadow Road among other locations. *This Horticulture Highlight was originally published in the December 2010 issue of the Friends of Mount Auburn electronic newsletter. Left a message on your answering service before I explored the website. Very impressive. The Mt. 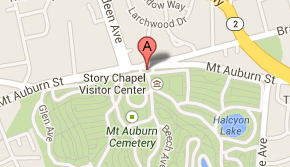 Auburn cemetery is a remarkable place. I visit several times a year in different seasons and when I am leaving I always comment on how lucky we are to have it and enjoy such a beautiful place. I was walking with some friends last weekend and we were really interested in some of the trees. We wrote down some names and did some research. Is there a map of where the different tree specimens are in the cemetery? We were interested in a few different types (himalayan pine is one). We found one of those pines, but were looking to see if there were other himalayan pines in the cemetery. Is there a map available that list the different trees and where they can be found? We really enjoyed our visit and wanted to continue to come more often and enjoy the beauty. I applaude all the people who keep the cemetery looking so wonderful. If you could let me know, I would really appreciate it.